It is said there are 84,000 dharma gates, which is a poetic way of saying there are infinite ways to enter the practice of the Buddha dharma. And over the centuries Buddhism has developed an enormous diversity of schools and practices. One way to understand how this diversity came about is by understanding the three turnings of the dharma wheel. The dharma wheel, usually depicted as a wheel with eight spokes for the Eightfold Path, is a symbol of Buddhism and of the Buddha dharma. Turning the Dharma wheel, or setting it in motion, is a poetic way to describe the Buddha's teaching of the dharma. In Mahayana Buddhism, it is said the Buddha turned the dharma wheel three times. These three turnings represent three significant events in Buddhist history. The first turning began when the historical Buddha delivered his first sermon after his enlightenment. In this sermon, he explained the Four Noble Truths, which would be the foundation of all the teachings he gave in his life. To appreciate the first and subsequent turnings, consider the Buddha's position after his enlightenment. He had realized something that was beyond ordinary knowledge and experience. If he had simply told people what he had realized, no one would have understood him. So, instead, he developed a path of practice so that people could realize enlightenment for themselves. In his book The Third Turning of the Wheel: Wisdom of the Samdhinirmocana Sutra, Zen teacher Reb Anderson explained how the Buddha began his teaching. "He had to speak in a language that the people listening to him could understand, so in this first turning of the dharma wheel he offered a conceptual, logical teaching. He showed us how to analyze our experience and he set out a path for people to find freedom and liberate themselves from suffering." His purpose was not to give people a belief system to soothe their suffering but to show them how to perceive for themselves what was causing their suffering. Only then could they understand how to free themselves. The second turning, which also marks the emergence of Mahayana Buddhism, is said to have occurred about 500 years after the first. 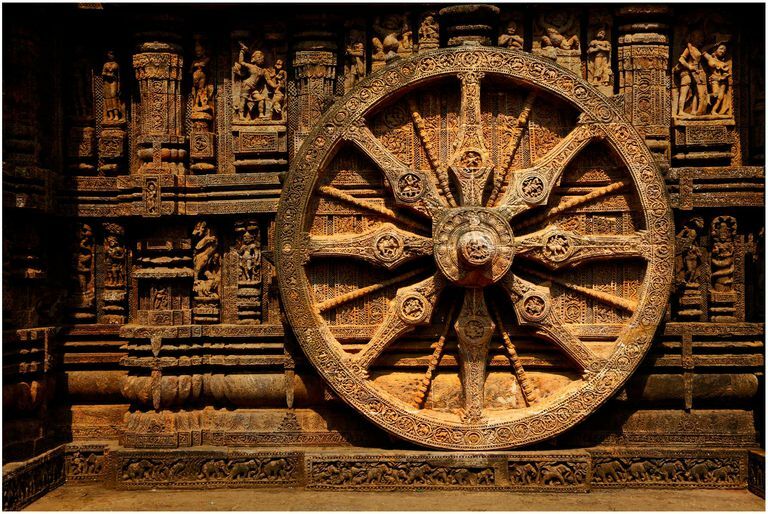 You might ask if the historical Buddha was no longer alive, how could he have turned the wheel again? Some lovely myths arose to answer this question. The Buddha was said to have revealed the second turning in sermons delivered on Vulture Peak Mountain in India. However, the contents of these sermons were kept hidden by supernatural creatures called nagas and revealed only when humans were ready. Another way to explain the second turning is that the basic elements of the second turning can be found in the historical Buddha's sermons, planted here and there like seeds, and it took about 500 years before the seeds began to sprout in the minds of living beings. Then great sages such as Nagarjuna came forth to be the Buddha's voice in the world. The second turning gave us the perfection of wisdom teachings. The main component of these teachings is sunyata, emptiness. This represents a deeper understanding of the nature of existence than the first turning doctrine of anatta. For further discussion of this, please see "Sunyata or Emptiness: The Perfection of Wisdom." "... all living beings will eventually be led by me to the final Nirvana, the final ending of the cycle of birth and death. And when this unfathomable, infinite number of living beings have all been liberated, in truth not even a single being has actually been liberated. "Why Subhuti? Because if a bodhisattva still clings to the illusions of form or phenomena such as an ego, a personality, a self, a separate person, or a universal self existing eternally, then that person is not a bodhisattva." Reb Anderson writes that the second turning "refutes the previous method and the previous path based on a conceptual approach to liberation." While the first turning made use of conceptual knowledge, in the second turning wisdom cannot be found in conceptual knowledge. The third turning is more difficult to pinpoint in time. It arose, apparently, not long after the second turning and had similar mythical and mystical origins. It is an even deeper revelation of the nature of truth. "This [doctrine] declares that the fundamental nature of mind is utterly pure and primordially in the state of buddhahood. It is the absolute buddha. It has never changed from beginningless time. Its essence is wisdom and compassion that is inconceivably profound and vast." Because all beings are fundamentally Buddha Nature, all beings may realize enlightenment. Reb Anderson calls the third turning "a logical approach that is based on the refutation of logic." "In the third turning, we find a presentation of the first turning that is in accord with the second turning," Reb Anderson says. "We are offered a systematic path and a conceptual approach that are free of self." ... our fundamental nature of mind is a luminous expanse of awareness that is beyond all conceptual fabrication and completely free from the movement of thoughts. It is the union of emptiness and clarity, of space and radiant awareness that is endowed with supreme and immeasurable qualities. From this basic nature of emptiness everything is expressed; from this everything arises and manifests. Because this is so, all beings are without an abiding self yet may realize enlightenment and enter Nirvana. What is the Trikaya in Buddhism?